1. Combine all the ingredients in a saucepan and bring to simmer, stir it in between.Do not boil it. 2. Rinse four bowls under cold water,do not dry and distribute the panna cotta mixture evenly among them. 3. Keep refrigerated until firm, about 3 hrs or overnight. 1. 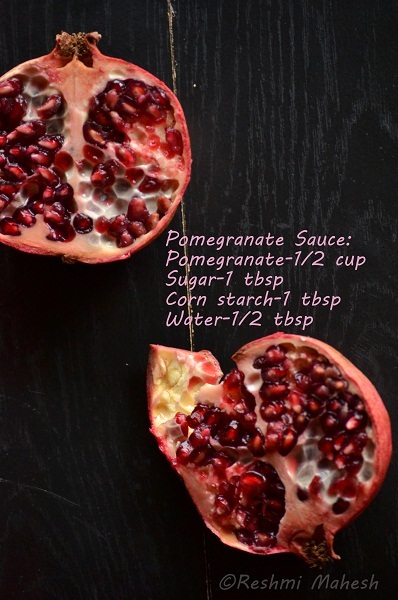 Blend the pomegranate seeds to extract juice or use ready made pom juice. 2. Heat the pom juice with sugar on low flame. 3. Add the corn starch mixed with water to thicken the pom juice. 4. Once little thick turn off the heat and allow to cool. 5. Now pour/drizzle this on top of the panna cotta and serve. 1. I have used some pom seeds and few cashew bits on top of sauce. Add according to your wish..It just adds to the taste..
Looks so cool, I love your photos, the recipe looks so simple. 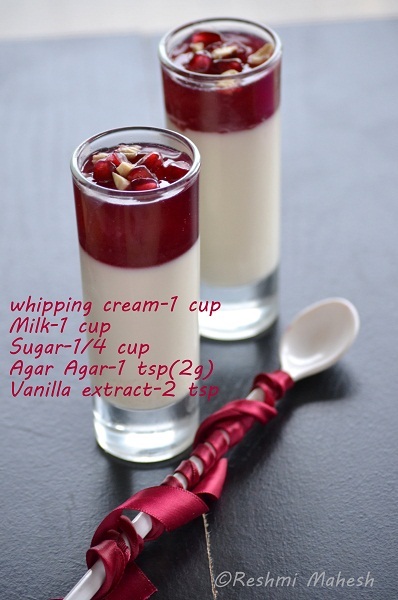 I think I will try this maybe with mango - since the recipe has agar agar and not gelatine. The pics are amazing. Wow, that looks so tempting and lovely. this is too good. Yummy. 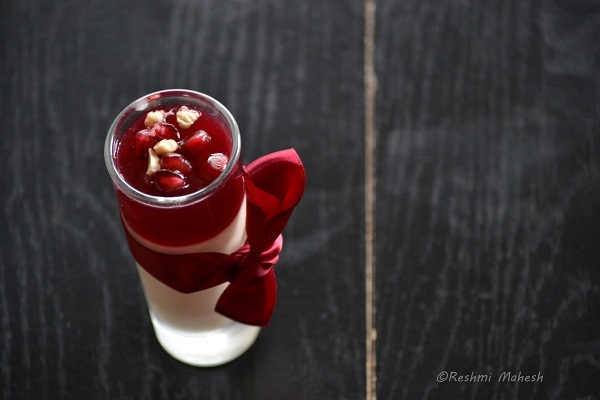 colourful and yummy dessert...will try this..
very beautiful snaps.. and lovely dessert..
very delicious looking pom panna cotta...perfectly done n neatly presented!! Superb color n tempting click! !Loved it..
wow....gorgeous clicks dear....looks wonderful n beautiful presentation !!! Looks tempting and nice clicks. wow loved those glasses !! great presentation dear !! looks so refreshing and nice one !! 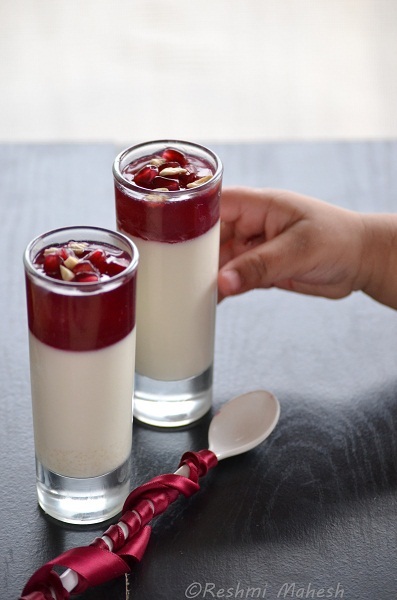 Nice clicks n eye pleasing dessert! WOW speechless at the pictures, looks absolutely divine. Wowwwwwww.. looks super delicious and perfect.. love the presentation too.. gr8 job dear !! Lovely colorful treat.Pomegranates are coming into the markets now. wow!! dats a beauty !!!! this is soooooooooo beautiful!! !love the way you've set the individual glasses.....really nice. Beautiful and fabulous clicks dear..Perfect. Wow delightful dessert..looks superb,nice clicks dear..
Wow what a delectable dessert. Wow!! !so beautiful and delicious...loved the recipe and the awesome clicks..superb. 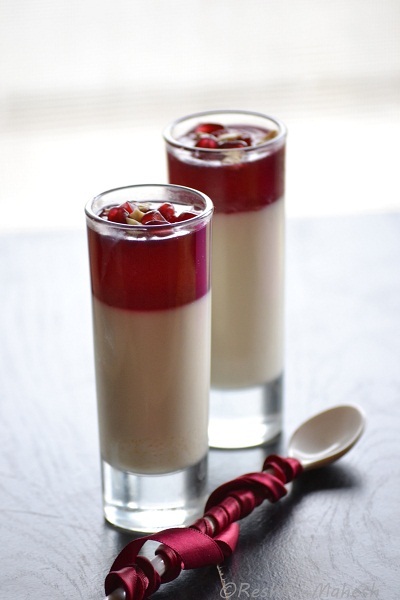 Wow seriously wat an elegant and mindblowing pannacotta. This is hi-fashion in desserts. I love how you have presented it, classic, elegant, mysterious. I'd love to try this at home. That looks so beautiful...Have to try it. Lovely clicks and delicious desesrt..
Wow !! 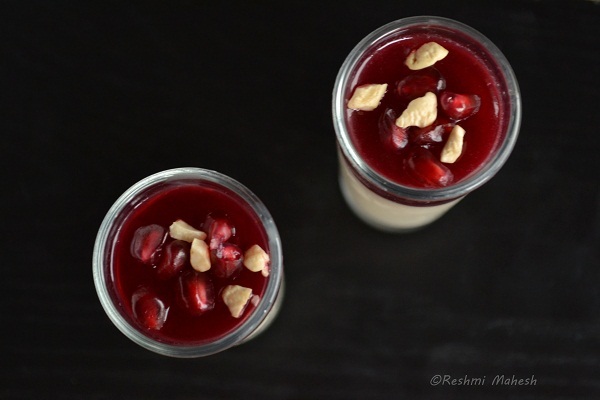 So so so gorgeous the pics r..the contrast of whiteness of the pannacotta with the pinkness of the pomegranates is spectacular ! 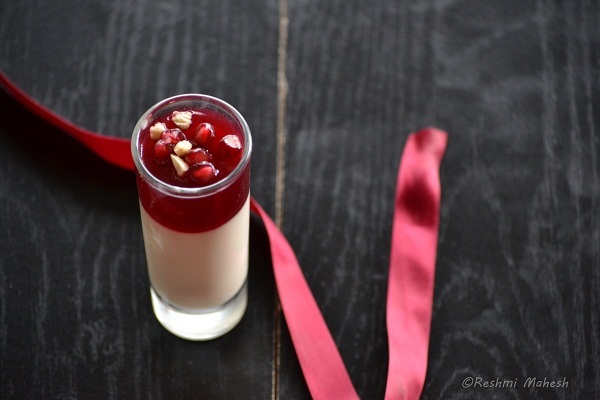 so totally impressive...I am all over the recipe..
An award for you at my space.. Do collect..
Lovely clicks and delish Panna Cotta..yummy dessert..glad to find u and following u now..
Reshmi, OMG! This looks so stunning!! Loved the recipe and saving this recipe for the weekend. Wow super panna cotta..has tried panna cottas sever times and all those who had it loved it,but never tried the pomi one...love the colour,looks heavenly ! very vibrant pictures reshmi... Simply amazing..